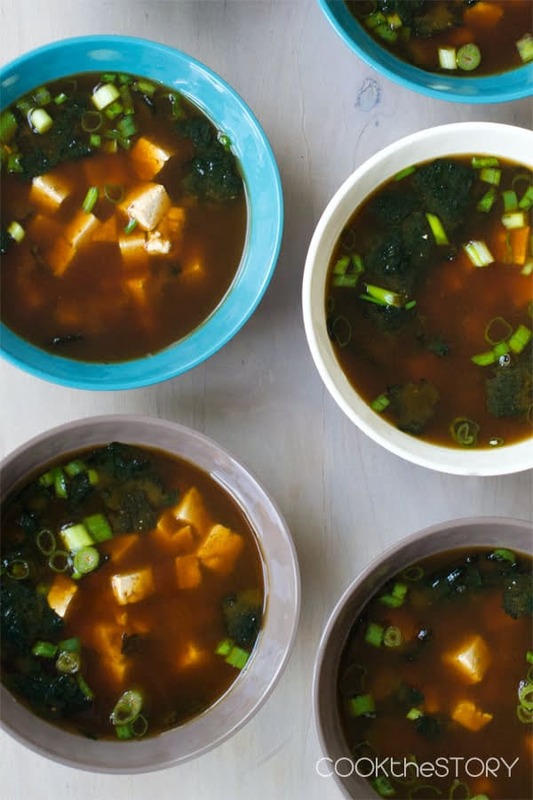 This easy miso soup recipe comes together in under 15 minutes. Now you can have that rich and comforting Japanese restaurant favorite at home in no time. Here’s a quick and easy miso soup recipe that doesn’t use any hard-to-find ingredients, such as dashi (we’ll get to that in a minute). You’re going to love making this restaurant favorite at home. Last week, I explained how to make a sophisticated, but easy, kale and beet salad at home. Today, I’ve got another restaurant dish up my sleeve, but this one from the world of Japanese fare. It’s miso soup, a rich broth you often get at sushi restaurants before the sushi comes. Miso soup has a number of ingredients that may be difficult for you to find, depending on where you live and shop. I’ve done my best to make this as simple as possible by not requiring many of the ingredients and giving substitutions for those that are harder to find. You will definitely need miso. Miso is a paste made of fermented soybeans. That sounds kind of gross, but it’s actually a rich and flavorful ingredient that combines soybeans, rice and barley. It’s salty, but can have nutty or meaty undertones. Be aware that there are different colors and flavors of miso. All are good to use, just taste as you cook. It’s easier to add more miso to achieve the flavor you want than it is to take it away after the fact. When it comes to finding miso, check your regular grocery store. My grocery store, which is in no way a fancy one, has it in the ethnic food section. If it’s not there, go to a specialty store or order it online from here. Tofu, otherwise known as bean curd, is usually found refrigerated in the produce section of the grocery store. If you don’t like tofu, go ahead and use chicken, cooked and cubed, or just skip it. Don’t forget something green for a pop of color. The green stuff that’s usually floating in miso soup is seaweed. Seaweed is sometimes sold in the ethnic section of grocery stores. It comes in dried sheets that you need to hydrate before using. If you can’t get seaweed, don’t worry about it. Use some chopped, fresh spinach. Good news: Dashi is not called for here. Miso soup also usually contains dashi, a Japanese cooking broth which can be made with fish. But my regular grocery store and two of my nearest high-end grocery stores don’t carry it. I therefore decided to skip it. In place of dashi, I’ve used a few drops of fish sauce, which is much easier to find and more versatile. You will definitely find fish sauce in the ethnic aisle of your grocery store, usually near the chili pastes and soy sauces. It’s a liquid sauce that you store in your refrigerator after opening. It has a strong taste, so a few drops can really transform a dish. Fish sauce is common in Asian cuisines. People use it as a dipping sauce for meats or even as a flavor enhancer in casseroles. See here in my Easy Vietnamese Pho recipe, where I explain how fish sauce can be used to add meaty flavors to other soups, stews, gravies and sauces (even non-Asian ones!). That’s it! A bit of broth and you’ve got it all. The SouperTip that makes today’s SOUPin15 recipe so delicious is the miso. It helps the soup because it adds depth to the soup’s flavors. I’ve found a million uses for miso since I first purchased it. I’ve used it to richen Asian and non-Asian soups, I’ve spread it on steaks before grilling and I’ve tossed veggies with it before roasting. It’s a really useful and delicious ingredient to have in your fridge. If you haven’t tried cooking with it before, I think you’re going to love experimenting with it. 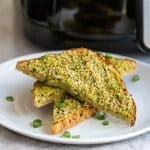 Here are some recipes from thekitchn.com that use miso to get your started. 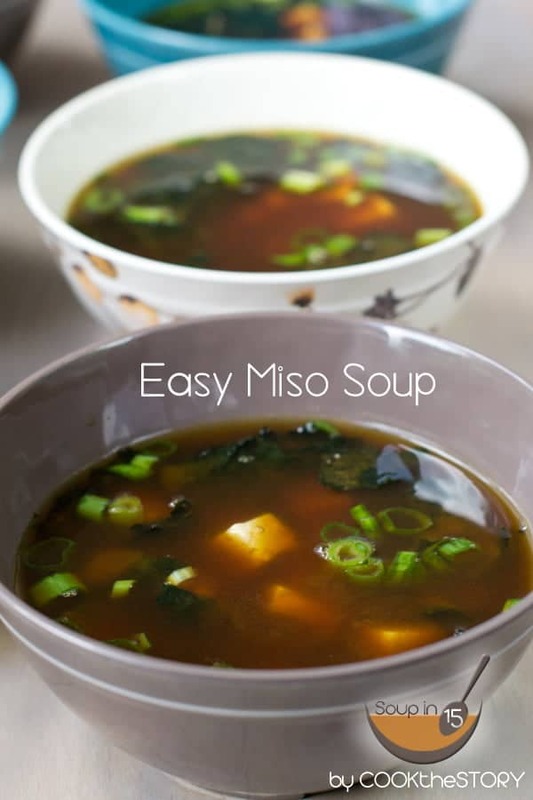 And now, here’s my recipe for Quick and Easy Miso Soup. See you in 15! 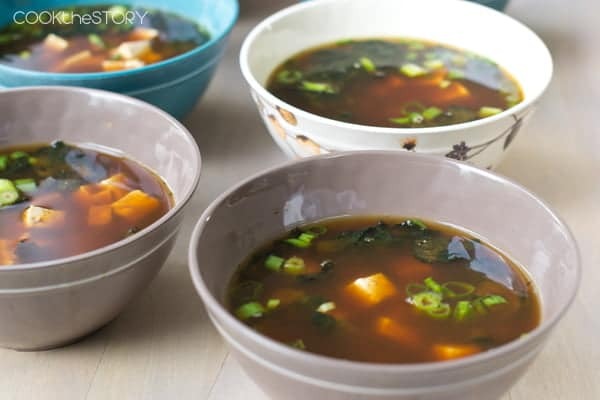 Instead of dashi, a traditional ingredient for miso soup that can be hard to find, this version uses seafood stock or chicken stock with a bit of fish sauce added to it. Note, if you can't get seaweed, you can use spinach. Don't mix it into the soup pot though. Instead, chop up 2 cups of fresh spinach leaves. Add some to each soup bowl. Ladle the soup over top so that the spinach will wilt just before serving. 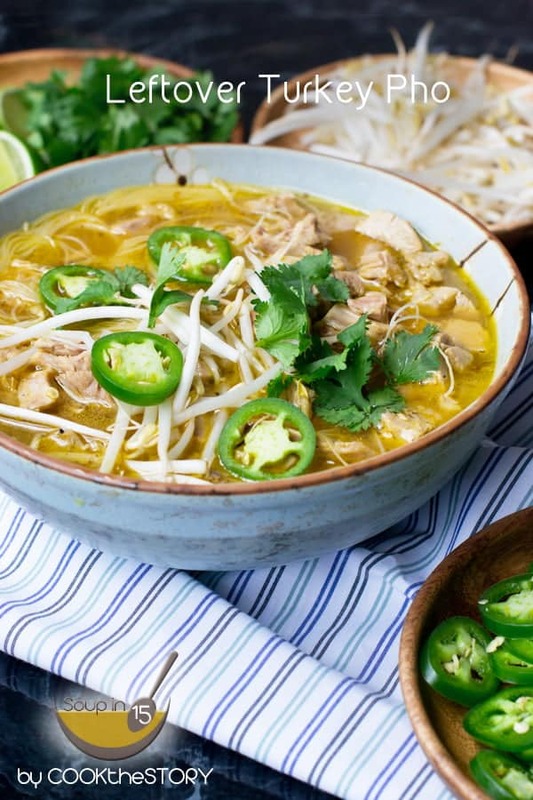 This soup is ready in 15 minutes from start to finish. Before you start read through the recipe. As you read gather together all of the ingredients, tools, pots and pans that you will need. But don't prep any ingredients. All prep is included in the instructions and is contained in the 15 minutes. Put a large pot or Dutch oven over high heat. Add the broth and the fish sauce. Cover and bring to a boil. While the soup heats, break up the seaweed into 1-inch pieces. Put it into a large bowl and cover with cool tap water. Let sit in the water for 2 minutes. Drain and set aside. While the seaweed is soaking, cut the tofu into 1/2 inch squares. Chop the green part of the green onions. When the broth reaches a simmer turn the heat to very low. You won't want the soup to reach a boil after this point. Measure 1 tablespoon of the miso paste into a small bowl. Add a tablespoon of the hot broth. Stir. Add another tablespoon of broth. Stir and then add it to the soup. Stir and taste. If you like the flavor, move onto the next step. If you'd like a stronger miso flavor, dissolve another tablespoon of the miso into a bit of hot broth and add it. Continue to repeat until you have the desired taste. If you go too far and add too much miso, dilute the soup with hot tap water 1 cup at a time. Add the tofu to the soup and stir gently. Let it heat through for 1 minute. Divide the seaweed and green onions between 6 soup bowls. Ladle the soup over top. How are GMO foods unhealthy? Show me the studies. Most of the tofu in the US, the vast majority of it, is made from genetically modified soy beans. NOT healthy. Japan has banned all GMO seeds and crops, as have many other counties. There are Miso paste that contains Dashi! I always use those Miso. 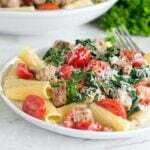 Saves me a lot of time and they are really delicious! Wow! I’m going to be on the look out for those! Hey thanks for the post! I haven’t made miso soup in a dogs age. After finding some nice miso at the store, I was inspired to do it again, but had no bonito flakes or dashi and found your post giving me permission (and direction) to use fish sauce. I’m also tidying up my cupboards and found my lifetime supply of wakame seaweed. If you can find it, it’s much better than the nori sheets for miso soup. I made mine tonight with a weak store bought veggie broth (1 jelly cup:12cups water), and veggie infused tofu (first time trying, verdict: yum! ), and 4 generous tablespoons miso, served topped with the green onion, a pinch of whole sesame seeds and a few drops toasted sesame oil. It was really lovely on this snow stormy day! Thanks again! Thanks for letting me know about your miso soup experience. It sounds really delicious! Now I want to make some! Thank you so much for this recipe! I made it–with a bunch of additional stuff to turn it into a meal in a bowl since my vision of miso soup starter followed by sushi was frozen by the polar vortex! Your directions are so clear and easy. 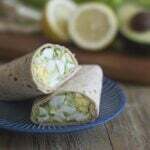 It was simple to make and tasted delicious. Kirsten, I’m so so happy that you liked it. Thank you for letting me know how it turned out for you. I appreciate your feedback very much! I absolutely adore miso soup! I always embrace a steaming bowl of miso soup, but have never made it at home. Love! I just love this soup, and love the added seaweed — one of my favorite things. Great pix, too! My spouse loves miso soup, and since we moved we never go out for sushi anymore. I tried the dried packets but they were about as good as you might expect a dried packet of soup to taste! I’m glad to see this recipe today–my son’s sled hockey practice, on Monday nights, is minutes away from the Cincinnati Asian Market (and an hour away from my house). Now that it’s on my mind, thanks to your recipe, I’ll confront the bewildering array of miso paste at the CAM so I can make this for my spouse. 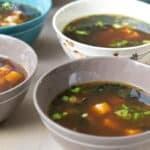 I have always wanted to make miso at home, my kids love it when we eat out and I know it’s so good for you. What a comforting belly warming soup Christine, love it. I love soup. I love this kind of soup. I love easy. This works for me. Thank you! Miso soup is definitely a new favorite of mine. I didn’t grow up with these flavors but I’m now loving them. Will definitely save this recipe. I have miso and amy craving soup right now. Think I am going to whip up a batch. Miso soup has been on my bucket list of things to make at home for forever! I’m so glad you posted this, I’m bookmarking it and trying it soon!